“…The garden is true intimacy with the Father, and it’s a place where He intended for us as humankind to be surrounded with His creation. There’s life in things that He’s created. I want to lead people into intimacy with the Father. It’s something that’s so important as we walk through stuff in our lives…” Kari Jobe, associate worship pastor at Gateway Church in Dallas; is one of my favourite female vocalists over the past few years, and has had quite a few busy years, garnering praise, accolades and fans in both the Christian and mainstream industry. It’s been 5 years since Kari’s highly successful sophomore album Where I Find You was released to critical acclaim and top spot on the Billboard charts in January 2012; while Kari also re-recorded the album in Spanish. And 3 years ago, in 2014, Kari also released her third full length album, the live Majestic, to rousing praise as well, with all the tracks being brand new, and recorded at the historic Majestic Theatre in her hometown. Capitalising on that success, Kari also unveiled Majestic Revisited in 2015- the same 13 songs from Majestic but re-recorded in a new light in the studio, with more piano, synth and soothing and calming effects. Now, it’s time for a brand new album. Kari’s newest studio offering The garden releases today, and boy what an album it is! Comprising of 14 tracks of pure, raw, emotional and honest worship to Jesus, inclusive of the inspiring single “The Cause Of Christ”, the contemplative and reflective title track and covers from Elevation Worship and Jesus Culture (“Here As In Heaven” and “Miracles” respectively); Kari’s emotinla, vulnerable and exquisite 1 hour plus journey of drawing closer and closer to Christ through song, is well worth the listen, and is one of my favourite albums of the year thus far, along with albums from Zach Williams (Chain Breaker), Cimorelli (Alive), Anthony Evans (Back To Life) and Danny Gokey (Rise). Released last year November, Kari’s “The Cause Of Christ” was a single that had a low key release, though I reckon this is Kari’s most inspiring and encouraging song ever! In fact, I would say that “The Cause Of Christ” could possibly be one of the most overplayed songs on the radio this year. Yep, that’s my prediction! Not because it’s CCM or cliché, but because it’s so, so good! Standing at 5 minutes long, the song is brilliantly led by keys and an inspiring notion that Jesus is Lord over our everything, and it is He who we as Christians should and can lay our life down for. When Jesus says ‘go’, we shouldn’t hesitate, and Kari unequivocally proclaims in the chorus, a declaration that we all should say and mean in the future, that ‘…for this Cause I live, for this Cause I’d die, I surrender all for the Cause of Christ, all I once held dear I will leave behind, for my joy is this, oh the Cause of Christ…’. Doing something active for Christ is important, and Kari demonstrates this with this inspiring worship anthem that is more than just lip service to God, but rather a call to action, as Kari confronts us about what we are going to do with our faith, whether it is passive or active. Over the next 4 months from the release of “The Cause Of Christ” til now, Kari unveiled more songs. “Heal Our Land”, “Fall Afresh” and the title track are the rest of the promotional singles, which also tug at my heart, as a sit back and dwell upon my relationship with the Almighty and my Creator. Driven by soothing keys and vibrant synth, Kari invites us into a refreshing and honest 6-minute journey through metaphors and imagery in the title track, as she describes the moment she meets Jesus for the first time, the moment we all become Christians, that ‘…I can see the ivy, reaching through the wall, ’cause You’ll stop at nothing, to heal my broken soul…’. Opening the album, the title track is the perfect way for us to be immersed into Kari’s lavish and exquisite journey, where Kari describes how Jesus provides her with life and life abundantly, and while every other song after this isn’t that grandiose in terms of descriptors, the track does set the tone in terms of honest, personal worship. “Heal Our Land”, a simple yet powerful prayer asking God to heal our broken land, and unite us all again, yearning for Him to ‘…breathe on Your church, pour out Your presence, speak through Your word, we pray in every nation, Christ be known, our hope and salvation, Christ alone…’, also released prior to release date, is a track that could be sung in churches on Sundays in the near future, while “Fall Afresh”, co-written with Sarah Reeves and Henry Seeley, delves into how it’s the power of the presence of the Holy Spirit and of Jesus Christ that transforms us into a new creation, and into the people we were made to be; is another personal highlight, with this being yet another song that I can close my eyes and just commune with God and sing His praises. With me already knowing 4 songs of the album before listening to the remainder 10 tracks, I already knew that I would love The Garden as a praise and worship album and boy was I not disappointed! Some worship albums can seem to be for personal worship and others for congregational worship yet there is a happy medium for The Garden, with each and every song able to be sung at home in our bedrooms or on Sunday mornings at church. The anthemic synth and keys led “Let Your Glory Fall” is a soothing and refreshing melody, where Kari proclaims to God, asking Him to let His glory fall in Earth, so that we can be full immersed in His likeness and perfect nature, so that we can do great works like Jesus did all those years ago, and we can point people to the One who has changed our lives forever; while Kari further makes God’s name famous with the prayerful and worshipful “Lover Of My Soul”, led by keys and synth, a reflective ballad where Kari cries out ‘…Jesus, all my heart belongs to You, Jesus, every heart belongs for You, the Lover of my soul hold me in Your arms forever, it’s You and You alone, burning in my heart…’. “Speak To Me”, the longest song on the album, standing tall at nearly 8 minutes (although half and song is essentially spontaneous free worship), yet another simple and also inspiring melody, takes liberties from the Old Testament, with the notion of us asking God to speak to us as we are listening, kind of what Samuel did when he thought Eli was speaking to him, as Kari encourages us to ask God to speak to us, as we never know what He will say, when He will say it, nor the outcomes. Which in my opinion, will be exciting and breathtaking, as I believe Jesus orchestrates all in order for us to draw closer to Himself and allow us to grow as Christians and as people. While the haunting, mysterious, yet also big, booming and grandiose epic worship anthem “Miracles” is just as flawless, enjoyable, spine-tingling and exhilarating as the Jesus Culture and Chris Quilala led version, as Kari fervently cries out that she believes in the God of miracles, that ‘…the God who was and is to come, the power of the Risen One, the God who brings the dead to life, You’re the God of miracles!…’. Kari also delves into the personal, the emotional, and the honest in the piano led “I Will Sing” as she cries out that ‘…even when my breath is weak, I will sing, I will sing, even in my suffering, I will sing, I will sing…’– the declaration that she will praise God at all times, no matter the circumstances, because He is faithful and He is good; and the notion of God drawing us closer to Him through creation and our personal experiences in the aptly titled “Closer To Your Heart”. 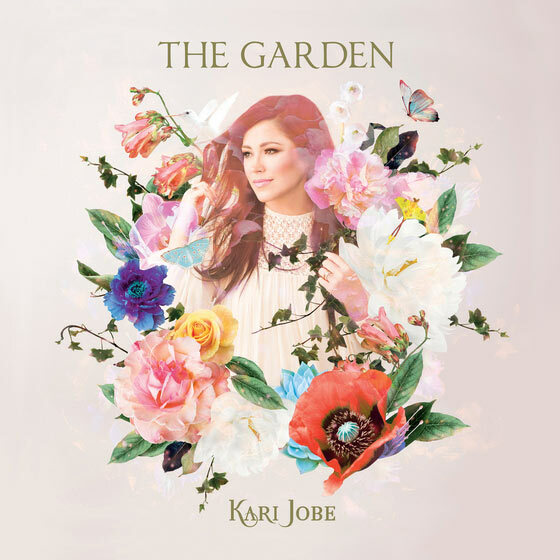 The final song on the standard edition of The Garden is “Oh The Power”, and this is something that Kari hasn’t recorded before in her career thus far, with Kari vividly describing Jesus’ last days on earth, and how He went to the garden of Gethsemane to be in communion with God before his death, also encouraging us to commune with God in our spiritual garden of Eden, as we become more and more like Him as each and every day passes. If by now these heavenly, captivating and out-of-this-world 11 God-given melodies from Kari haven’t sold you yet on buying The Garden, or at least checking these tracks out on Spotify, the last three deluxe edition tracks most certainly will. “Here As In Heaven” is a reflective worship anthem originally made popular by Elevation Worship, as both Kari Jobe and husband Cody Carnes eloquently reiterate that God’s love surrounds us and that His will is being done on earth now, as it is in heaven; while both “Come Alive” and “On The Throne” (previously recorded by Desperation Band on their 2014 album Banner) are solid worship melodies well fit for the Sunday morning service, as both highlight and showcase Kari’s earnest fire for Jesus and her love for leading people in communion with God. “…Everyone who’s seen something grow out of the dust realizes God was up to something in the midst of pain and questions. He never promised that it would be easy or that it would be pain-free, but that He would never leave us or forsake us. I’m more aware of His presence than I think I’ve ever been. God has surrounded us with things that will be life-giving if we take a moment to realize it. God’s always at work in our lives. He truly does go before us and prepares the way for the journey ahead…” If you haven’t had the pleasure of listening to Kari Jobe’s albums before and are not sure whether to give her music a go, then I would say The Garden is the best way to start, and then maybe work backwards through her discography. With “The Cause Of Christ” being in the top 5 of my favourite songs of Kari; there’s no doubting the passion, enthusiasm and strong faith for Jesus that Kari has. Sure to be popular and probably sung over and over during the coming years, I can tell that I will love this song and the album more and more with each successive listen. So…with “The Cause Of Christ” being one of my favourite CCM songs of 2016/2017, you will not so wrong with picking this album up at iTunes or any other digital retailer today! Yes… today! You will find many favourites, as Kari encourages us to sing to Jesus and declare that ‘…then I saw the garden, Hope had come to me, to sweep away the ashes and wake me from my sleep…’. I’ve listened to this album about once or twice and I think I should listen to it more based on your review. My favorite tracks are Closer to Your Heart, I Will Sing and Come Alive. I guess I’ll have more favorites when I have a repeat listen.